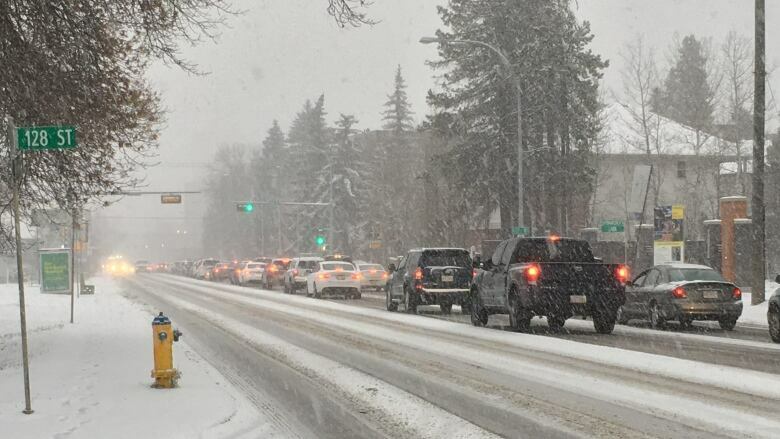 The morning rush hour in Edmonton was dicey Friday as freezing rain and a dusting of snow covered roads and highways across Alberta in black ice. Driving around Edmonton was dicey Friday as freezing rain and a dusting of snow covered roads and highways across Alberta in black ice. Between 5:30 a.m. and 3:30 p.m., 206 collisions were reported to police. The total included 180 property damage collisions, 12 injury accidents and 14 hit-and-runs, police said in a news release. Minor fender-benders caused bottlenecks and traffic jams across the city. Edmonton police urged drivers to have patience. 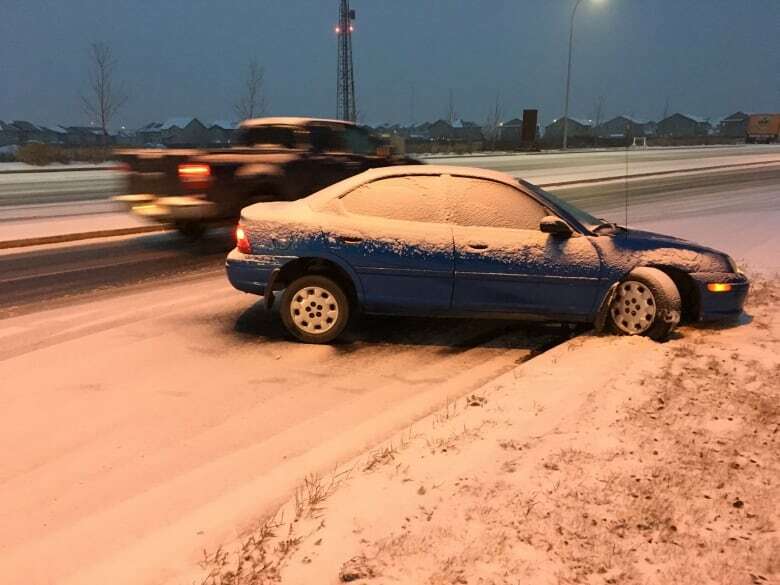 "Your vehicle is not as skilled on ice as Connor McDavid," the Edmonton Police Service said in a tweet. "Your tires are not skates. You cannot speed down a wintry road and expect your vehicle to make a hockey stop." Staff Sgt. Barry Maron said drivers should give themselves extra time to reach their destinations safely. The roads were "awful," Maron said, and city intersections were especially slippery. Drivers can get a little rusty after a season of summer driving and the road conditions Friday were no help. "The ground isn't frozen yet so we're getting some warmth up from the ground which melts that first little layer and then puts ice on top of that," Maron said. "They're especially slippery this morning." Andrew Grant, general supervisor of infrastructure field operations with the City of Edmonton, said more than 70 trucks and other pieces of equipment are being used to clear "very wet and icy, heavy snow" from roadways. More than 150 labourers are working to clear snow from sidewalks and stairs, he said. Brine will be used to de-ice roads. But Grant said city crews chose not to use brine on wet roads overnight as an anti-icing agent. He said sand is not being used. "We'll be back down to bare pavement hopefully in the near future and sand wouldn't provide much traction on bare pavement." Grant urged drivers to give plows room to work. "I think it's important to get the message out there to leave lots of room for stopping, leave lots of room for your fellow Edmontonians," he said. "Drive to the conditions and keep everyone safe. "It's a really important message that we do drive to the conditions as a city. We're all in this together." Alberta highways were also slick. Environment Canada issued freezing rain warnings for much of central Alberta, including Red Deer, Ponoka, Rocky Mountain House and Nordegg. Emergency crews, including the Millet Volunteer Fire Department, were called to the scene of a jackknifed semi around 5:30 a.m., on the QEII near Township Road 484. No one was injured but RCMP remained on scene to direct traffic around the crash, said Capt. Trevor Palmer, public information officer with the Millet fire department. Returning to the station from that scene, firefighters came across a gravel truck that had gone off the road near Township Road 481. Palmer pleaded with drivers to slow down for emergency vehicles. "There were everything from passenger vehicles through to fully-loaded semis that were blowing by us," he said. "The roads out there are glare ice." Incident 18-135: on scene of a jackknifes seminin the area of TWN 484 on the QEII highway. Traffic is barely slowing as it passes our emergency crews despite the icy conditions AND Flashing lights. RCMP responded to a multi-vehicle collision eastbound on Highway 16 at Highway 830, east of Ardrossan. Drivers in that area have been warned to expect delays. Environment Canada expects the freezing rain to develop early Friday morning in the Rocky Mountain House and Red Deer areas and move eastward through the day. The freezing rain should end by this afternoon. The advisory warned that surfaces like highways, roads, walkways and parking lots may become icy and slippery. "Take extra care when walking or driving in affected areas. Slow down driving in slippery conditions," reads the advisory. "Watch for tail lights ahead and maintain a safe following distance."